Home > Dressing > Fused Or Unfused Collars? There’s a lot of snobbery and silliness in the world of men’s clothing, but then it’s no different to any other field. One area where this is particularly acute is in discussion of whether a shirt should have a fused or unfused collar. Proponents of each type engage in something akin to sartorial top trumps; trading detail, luminary endorsement and experience in an attempt to prove themselves the connoisseur, and their opponent the school boy amateur. My view is that you’d do well to know the difference between them both and use each to their best affect. Obviously the collar and cuffs of a shirt need to be more solid than its body. To do this you take two pieces of shirt cloth (outer facings) and between them sandwich another, different type of material known as interlining. The interlining forms a sort of skeleton providing rigidity and shape. There are subtle differences adopted by each shirt maker, but on the whole whether you have fused or unfused collars both will use two outer facings and a piece of interlining material. So, what is the difference? The unfused collar is the more traditional method of construction and favoured by English shirt makers. The interlining is sewn into position between the two outer facings –similar to a floating canvas in a suit. If you pinch either side of the collar or cuff and pull the material in opposite directions you should be able to pull the two facings apart. Unfused collars will often feel softer too. 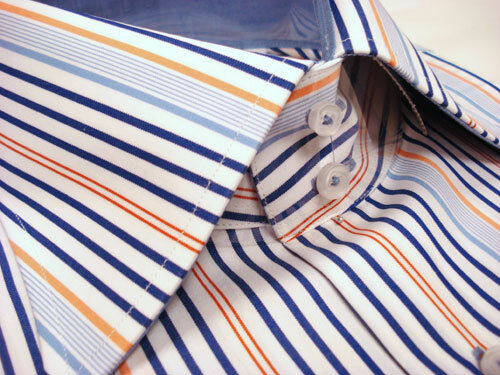 The fused collar is favoured by most Italian shirt makers. Here the interlining is glued/fused to one or both outer facings. Rub the collar between your fingers and typically you’ll find either no movement or one side of outer facing will move slightly. Fused collars tend to look a little sharper. Both types have their drawbacks. 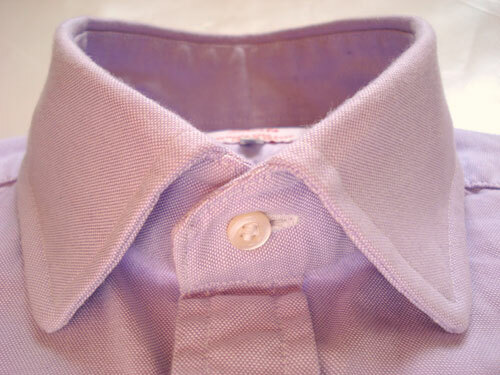 An unfused collar may pucker particularly if the interlining and shirt fabric shrink at different rates. If you’ve ever ironed a shirt collar and found a ridge or what seemed to be an excess of cloth at the collar points that’s the reason. A fused collar often gets a bad rap because earlier interlinings were very poor and often bubbled after a few washes –this is owing to the cloth being misaligned at fusing. Of course both have their benefits and you can use them to alter your look and provide added subtlety –just as a collar style can augment a particular look or physiology. Strangely, while an unfused collar is often softer it can appear more constructed and weightier, which in my view makes it ideal for wearing with suits and ties, providing for a very English look. Conversely, while many feel fused collars are sharper and stand better –particularly without a tie- they often look thinner, lighter, less constructed and more informal. I find them perfect for wearing with odd jackets, particularly when paired with jeans. 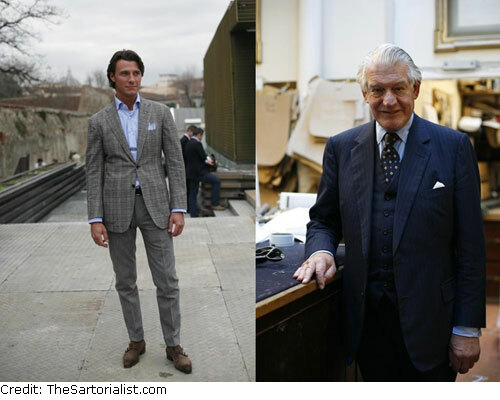 Here we look to Italian men, so often featured on The Sartorialist. Indeed, iron the collar right and you can get that lovely arching which most Italian men seem to acquire. So my advice, for what it’s worth, is use your collars to play with your look and leave the Top-Trumpers to their childish games. Nice post!i would always iron the collars except for flanel shirts! Nice article, one sidenote though! The man in the left picture isn’t Italian. He’s Dutch! Also the face of ‘Oger’.